Whoa... yes. I am ashamed to admit -- this is our garage. It is the home of a lot of accumulated junk. Believe it or not... there is also some workout equipment scattered in there. And yes, I do actually walk on the treadmill in all that mess. I think our garage is well past due for a MAKEOVER! 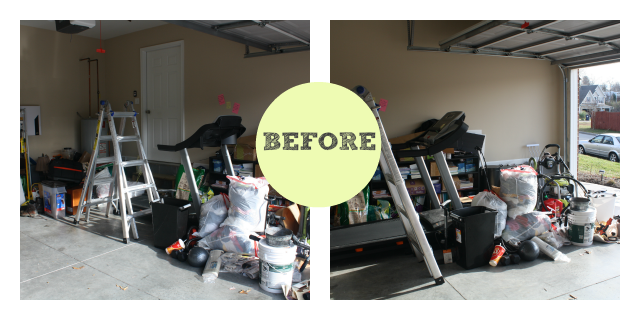 For a while now I have been wanting to convert half of our garage into a home gym. The time has come! Why a home gym? Well - I do really enjoy going to the YMCA. I love going to classes. However - sometimes it isn't always possible. Work runs over or something comes up and I can't make it to that class. Normally, I'd say - oh, well and then wouldn't work out. With a home gym, there are no excuses! You are supposed to pack your home with healthy food so that's what you eat. Well, I think the same goes with fitness. Also, I work from home. That means sitting ALL day in front of the computer. If I have equipment more accessible, it will be easier to get in some exercise here and there. The plan? The biggest part is the clean up! 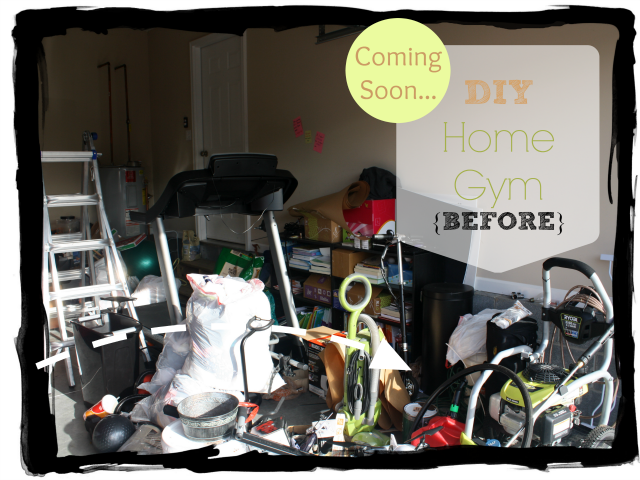 Add foam floor, a dry erase board, some inspirational quotes, organize my gym equipment - and BAM! A realistic and useful home gym. The makeover is underway and is almost finished! Stay tuned for the big REVEAL!